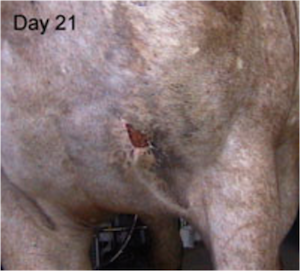 Laser treatment on Brady, Left rear flank cut in a fence, 9 days to complete heal. Casper, ruptured bursitis front left elbow. Bone exposure, total wound opening including surrounding damaged tissue was over 6″ in diameter. in 6 weeks time the bone covered in new skin, fur started to grow back and the area completely scabbed over to a size smaller that a quarter. The following photographs were taken of a 3 year old filly that ran into a gate. 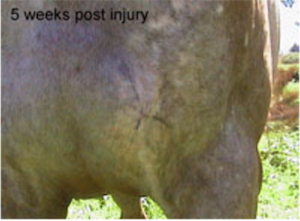 Because of the location of the injury it was not able to be stitched. She had daily laser treatments for the first 5 days then was treated 3 times a week until it healed at day 28 post injury. 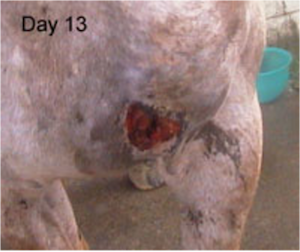 Day 3 — The wound was big and open, a tear in the muscle was also noticed, and it was very painful for her to move. Day 21 — The healing was nearly complete with only a small area still visible. Day 13 — By now the wound had formed new tissue and was starting to dry out and contract inwards. The filly was moving around freely and there was no sign of proud flesh formation. Week 5 — This photo was taken at week 5 to show how un-noticable the wound is. 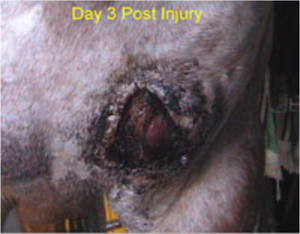 The wound was completely healed at day 28 but no photo was taken.